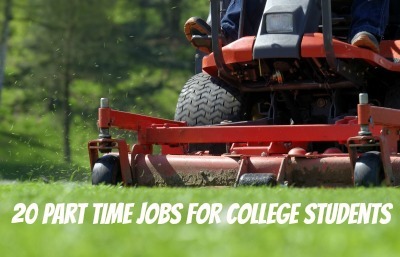 A student doesn’t have to leave campus to find part-time work. Although in many situations, these jobs are allotted to students who have applied and qualified for financial aid. So if you don’t need financial aid these jobs may be hard to come by but are worth pursuing nonetheless. 1. Work in the cafeteria. This was my part-time college job for four years, working in the dish pit and restocking plates, silverware and other food supplies. I was able to manage between 10-15 hours per week. It wasn’t always fun or clean (you try cleaning other people’s plates) but it did keep me from asking mom and dad for money all the time. 3. Be a part of the maintenance team. Several of my friends worked for the maintenance department doing mowing, trash cleanup and dorm room repairs. With all those frat parties there will likely be a few holes to patch and paint. 4. Be an RA. A resident assistant helps oversee various sections of a dorm. It’s unlikely you will get one of these positions your freshman year as they almost exclusively go to upperclassmen who have proven to be trustworthy and competent. Prove you are that and maybe pick one of these up by your junior year. 6. Sell your research papers. There are websites like myessays.com that purchase student essays and term papers. Prices can range from a minimum of $15 up to $100 for lengthy, high quality material. Just make sure you understand how the process works. And also check with your state…some have laws against the sale of term papers. 7. Participate in research or drug studies. All those braniacs in the science department are going to need humans to experiment on. (Haha…just kidding…sort of.) Listen for opportunities within your major’s department for professors seeking assistance for their projects. 8. Tutor. If you have the heart of a teacher and a skill for explaining concepts to people, market yourself as a tutor. The biggest needs for this would probably be found in the math, science and English (writing) departments. 9. Blog about college. It is possible to become proficient at making money from a blog. If you understand the process this might work for you. There are some very popular college themed blogs specifically geared towards college students. 10. Do people’s laundry. I know…it’s hard to believe doing laundry would find it’s way onto a list of part time jobs for college students. Believe it or not there are college students who can’t (or won’t) do their own laundry. That means you could cash in by doing someone’s undies. I saw it happen at my school time and time again. Of course, not all part time jobs for college students have to be on campus. Here are ten more flexible, off campus jobs that might fit with your time and talents. 1. Waiter or waitress. This may be the most flexible job of all for the college student. Store managers will work with your class schedule, especially if your work proves to be top quality. 2. Have a roommate. If you live off campus in a house or apartment this might be an option. While not technically a job, one could rent out a room and charge them a monthly fee. So you would sort of be acting like a landlord here. Make sure to check your rental contract first to make sure this is allowed. 3. Baby sit. All those profs and other campus staff members have (want) a life too. See if you can take their kids off their hands for a few hours while they enjoy a nice evening out. 4. Be a mystery shopper. I’ve always wanted to do this. Companies hire people to shop their stores to see how their employees are following company procedure. Plus you will feel like James Bond going undercover. 5. Be an extra in a movie. Sound far fetched? It happens. Movie studios are all over the country, even in my own tiny county of Fayette in Georgia. Just this past Saturday Pinewood Studios sent out an open casting call for extras for their upcoming production of Marvel’s Ant Man. Just don’t skip a test to be one of those screaming and running street people who flees when disaster comes. 6. Recycle. Not only are you earning extra money but you are cleaning up your college town and being good to the environment. 7. Sell photos. If you have an eye for photography consider selling your photos to online websites or news publications. 8. Washing or detailing cars. This might take a little start up money to get the necessary tools you will need. If you can go to people’s house or place of work to do this, you will increase your reach and profitability. Great thing is that this can be done on the weekend when classes are not in session. 9. Mow yards and do landscaping. Again some start up money is necessary but this is also a great weekend activity. 10. Give blood. Last but not least, this is an old standby on the list of part time jobs for college students – even though it’s not really a job…give blood. Again, several of my college buddies did this regularly to raise some cash. It’s important to understand how the process works and what to expect. Some centers will let you do this several times a week while others limit it to once a month. The going rate is $20-$40 per visit so this could add up quickly in some scenarios. With classes and other activities, your time in college to earn money will be limited. Be creative with your schedule so some part-time work can be plugged into it. As long as work does not negatively affect your classes it’s worth having that extra spending money around. And mom and dad will really appreciate you not nickel-and-diming them every two seconds. They’ve paid for enough already. For some further reading, check out this article from ThePennyHoarder.com: 32 Legitimate Ways to Make Money From Home. The article offers some very creative ways to make money, most of which are not mentioned on my list. And there is this great article at CashCowCouple.com if you are into taking surveys online to make money. Questions: What other part time jobs for college students would you suggest? What job did you have in college? How many hours per work did you work? What’s the craziest job you’ve ever heard someone doing to earn extra money while in college? Terrible job suggestions. This is something my parents would have suggested that I do when I was in college. With everything out there and the availability of the internet, there are so many more opportunities and jobs that people haven’t thought of besides such basic things that most people think of already. I wish you would have posted things out of the ordinary that most people don’t think about. There is a reason most people think about these things…because they are some of the easiest things to get involved with. I don’t doubt there are many more things people could do through use of technology and the Internet. But most people don’t know how to capitalize on using the Internet to make money. Perhaps you could share some ideas here? I would never recommend working at a grocery store in college. They are NOT flexible. “We schedule you when we need you”. I’m in college, and I got told they are flexible with school schedules. That was just a crock of lies to draw people in, so I think working on campus is the best option. One job that was left out is being a driver for Uber. You can make decent money, but the best part is really the flexibility. Drivers can log on and off whenever they want. Great for students with odd schedules. Download the app to your phone and enter code ”IM6JQ” for 20 bucks off your first ride. That’s like trying it for free! Then you can see for yourself how the whole thing works. Be sure to ask the driver what it’s like to be an Uber driver. I loved my on campus job. It was easy to get scheduling conflicts resolved because it was obvious to everyone working if different events were going on. Michelle recently posted…Do Women Spend More While on Their Period? When I was in college.. I worked in the computer lab, tutored, and delivered pizza a few days p/week. “…I never stopped hustlin’…” That’s the way to go if you want to graduate with minimal debt. I was always a waitress in college…mostly during the summers. I was lucky enough that I didn’t have to work during the main part of the school year. When I was an extra on the set of Parenthood, there were tons of students all their with their books and laptops. There is so much downtime so why not! I had a college friend who was a phenomenal pianist. He was paid up to $300.00 a month to play background dinner music at the country club in our college town (and this was back in the mid-80’s – I can’t imagine what that would be in today’s dollars). He not only paid his way through college by playing the piano, he along with his brother used the money that was left over to purchase mobile homes and rent them out. By the time he graduated they owned and managed 11 rental properties, a venture he continues to build and operate today. That’s a great job! And it spawned a whole new business venture…love it! You never know. I’ve never looked into the process of submitting pictures to istock or any of the other online imaging places. My guess is if the photos are eye catching enough she could get paid for them. I had two great work-study jobs in college – one was as a desk jockey at the student activities center and one was as a writing tutor. I probably only had work to do between 10 and 40% of the time so I was able to get some serious homework done while being paid. Post-college I have done some clinical trials (non-invasive! ), but the pay is way better where there isn’t a glut of undergraduates available. I am very surprised to see you suggesting getting paid to help other people plagiarize. It may be legal but it is highly unethical. “…suggesting getting paid to help other people plagiarize.” I was worried about that. However, after exploring that site, it seems that is not their intended goal. It says they do not condone plagiarism and the original articles that are submitted are intended for research purposes only. Whether people are using them for that reason remains to be seen. With all the plagiarism checkers that are available to profs nowadays a student would be stupid to attempt it. My sister and brother-in-law are both professors and can spot a plagiarizer a mile away. Only takes one sentence plugged into their web program and they can find it in less than a minute. Thanks for following up with your thoughts. As a former writing tutor this is a hot-button issue for me. I worked in the copy center at my college and it was one of the BEST jobs . I also babysat a lot and it was a really good way to make some quick cash. Great list, Brian. There are plenty jobs for college students and I think it’s important that they one. There is no reason to hit up Mom and Dad (or worse your student loans) for beer money. 🙂 I went to school locally so I was able to continue working in my Dad’s office. It may not have been quite as cool as some of my friends who had jobs at the Mall, but then again, I had no urge to spend any of my earnings at work. Being a Chemistry student, I used to work in the stock room and then as a lab assistant in the chemistry department. I also knew some people that worked in the Library and loved it because they could do their homework and get paid. “…do their homework and get paid.” That’s awesome…the best of both worlds. While in college, I was earning money from a variety of sources like modeling, singing and movie extra work. I also held evening and week-end part-time jobs as a receptionist in a car dealership and a teleconference operator (this gig was great because once the call was underway I could study a bit while monitoring the call). It all definitely helped with paying for expenses while at school with a full course load! Good list of jobs here! I worked as a writing tutor at my university’s writing center during the school year–still the best job I’ve ever had! I worked full-time during the summers as a restaurant hostess, campaign canvasser, in retail, at an amusement park, at a car dealership–basically whatever I could find. My husband worked at the art museum on campus year round and I think that was his favorite job ever, too! So I’m guessing as a writing tutor you taught/helped people how to write better? I could see the real need for that in college. Maybe that becomes a part-time gig for you now…helping bloggers analyze/edit their content. I’ve sure seen some writing on blogs that could use a lot of work. Yep, I helped people with their writing and loved it! I’ve seriously considered getting into freelance editing. I think it’s something I’ll probably pursue as a side hustle after we retire early. Certainly would be open to taking on clients now if anyone needs an editor :)! I worked as a nanny and house cleaner when I was a student. I thought it was fairly enjoyable and provided me with the cash I needed to make ends meet. Ooh…nanny and house cleaner. Those are great potential jobs! Great tips, Brian! I waitressed while in tech school and it was a nice money-maker for me. I would definitely recommend this for college students. My wife was a waitress for a time as well. It’s such a tough job…dealing with people. She really developed an appreciation for what a good waitress has to go through. Kirsten recently posted…Is Faith An Excuse to Not Try? Haha…that job at Daytona sounds like a good gig. I’m surprised they never evaluated how busy you were (not) and did some cutbacks from three to one. Sounds like they were overstaffed.